Nirupama Das’ voice quivered as she spoke about seeking justice for her father. Nirod Baran Das, a respected lawyer, took his own life last month, about three months after relatives said he began talking about the humiliation of being treated as a foreigner in the land where he was born. The 69-year-old lawyer and former professor was among the nearly three dozen Assam residents believed to have committed suicide since January as they faced mental anguish while trying to prove their citizenship, according to a rights group. Assam, which shares a 262-km (163-mile) border with Bangladesh, boasts the second highest number of Muslims – 34 percent – among all Indian states. Authorities began updating the state’s National Register of Citizens (NRC) this year, the first time since 1951, in a controversial move affecting its 32 million residents. 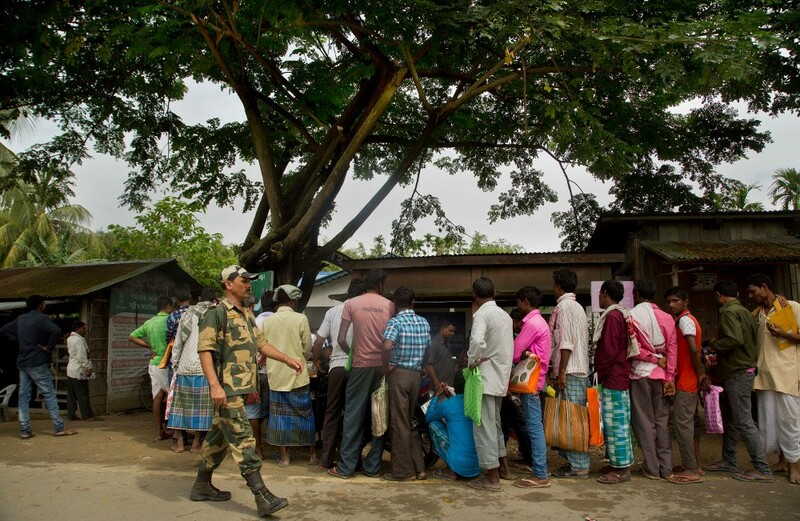 “As many as 32 people killed themselves over the NRC since Jan. 1, 2018, the day after the first draft of NRC was made public,” Prasenjit Biswas, chairman of the Assam-based NGO Barak Human Rights Protection Committee, told BenarNews. BenarNews could not confirm those figures, but Zamser Ali, state coordinator of the NGO Citizens for Justice and Peace, told firstpost.com early this month that his group had counted 30 suicides linked to the NRC. The difficulty in gathering accurate suicide-related figures, according to observers, stems from the tradition among news organizations to not report such deaths, as journalists often weigh the privacy interests of an individual’s family over the newsworthiness and interest among the general public. Speculation about Nirod Baran Das’ death swept his town, but Nirupama Das told BenarNews that her father committed suicide when he could not find his name in the final draft of the NRC. “A vicious environment has been created by the vested groups in the name of NRC to create fear among those whose names are missing from the final draft list,” she said, without elaborating. Nirod Baran Das had documents to prove he was born in 1946 in the city of Tezpur, on the banks of the river Brahmaputra, about 175 km (109 miles) northeast of Guwahati, according to his daughter. He tried to show documents to prove his citizenship, Nirupama.said, but no officer helped him. His name was among 115,000 included in the partial draft of the NRC published on Dec. 31, 2017, while the names of his family members were missing. When the government published the NRC’s final draft at the end of July, his name was left out while his family members had been added. Indian officials have said hundreds of thousands who fled civil war in Pakistan and crossed the border into Assam to escape the fighting should go back to Bangladesh. The government in Dhaka, on the other hand, says it will not accept them. Local officials said suicides have occurred throughout the state since the NRC process began. “This is the second suicide by a Bengali Hindu from the Darrang district. Earlier it was the suicide of a school teacher,” Ganesh Ghose, vice chairman of the Kharupetia town committee, told the online newspaper The Wire. Ashok Barman, deputy commissioner of Darrang district, told a local TV channel that an inquiry had been started to look into the circumstances behind the lawyer’s suicide. Last week, 65-year-old Mannas Ali, a Bengali speaking Muslim from Sonitpur district in Assam, also committed suicide, local newspapers said. Reports quoted Ali’s neighbors as saying the names of his son and two grandchildren had not appeared in the final draft of the NRC, making him depressed. Meanwhile, the reverification process in Assam is proceeding slowly. The Supreme Court on Thursday set Dec. 15 as the deadline for filing claims and objections for inclusion of names in the NRC. A bench headed by Chief Justice Ranjan Gogoi also allowed residents seeking inclusion in the NRC to prove their citizenship by using five documents which were earlier opposed by the NRC coordinator. These five documents include the NRC of 1951, voter list of 1966, voter list of 1971, refugee registration certificate until 1971 and ration card issued until 1971. The NRC update is supervised by India’s apex court, which ruled recently in favor of NRC coordinator Prateek Hajela’s suggestion to prune the five documents from the original list of 15. The NRC is aimed at detecting and deporting an estimated 20 million Bangladeshi migrants who should not be in India, according to the government. About 2,700 NRC help centers have been set up across the state to receive the claims and objection applications. An NRC official who requested anonymity said only 10 percent of residents had applied for reverification of their citizenship. Four million people have been excluded from the final draft, putting them at risk of becoming stateless.